Elizabeth Forward senior Tyler Wachs built a canoe in the school’s new FABLab, which allowed him to design the canoe on a computer that then cut the pieces for him. Here, he gives the canoe its second voyage in the high school pool. 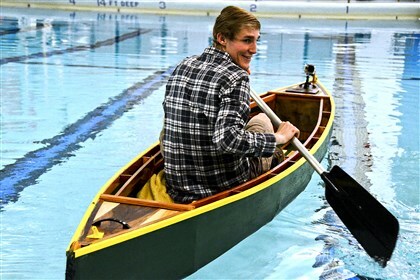 Elizabeth Forward High School senior Tyler Wachs spent the last nine weeks using computer-aided-design software, a computer controlled cutting machine, a 3D printer, a laser engraver and old-fashioned tools to build a canoe. On Friday, it got its first test run in the school swimming pool.